For this week's 52 Ancestors in 52 Weeks writing challenge from blogger Amy Crow Johnson of No Story Too Small, the theme is "Closest to Your Birthday." In Family Tree Maker for Mac, there is a "List of Individuals" report where I was able to create a birthday list including all individuals in my database sorted by birth date. Birthdays were always special days in my home growing up: my mother made sure of that. Interestingly, there are only three in my database with March 7 as a birthday, and my mother is one of them. The other two are on my father's side of the tree and not related to my mother. However, there are eight individuals in my database with my birth date of November 21 (including a newly-found second cousin of my husband's, who was also born in the same year as I was). Two of these are direct ancestors of mine! One is a 7th great-grandfather by the name of Isaac Colton, born on November 21, 1646, in Springfield, Massachusetts. Ancestry.com has a wonderful resource, with original images, for those researching Massachusetts ancestors: Massachusetts Town and Vital Records compiled by Jay and Delene Holbrook. Isaack Colton's birth appears a couple of times in this record. Following is the more legible entry; I have checked that they both agree on the details. In the 17th century, November was referred to as the ninth month. Isaac Colton married Mary Cooper on June 30, 1670 in Springfield, and fathered nine children. I only know that he lived in Longmeadow, next to Springfield, where he died on September 3, 1700. According to the Colton Genealogy (A genealogical record of the descendants of Quartermaster George Colton, found at ancestry.com, Google Books and others), his wife was captured by Indians on March 1676, was badly wounded, but survived. (In fact, she survived Isaac and lived to be 90!) They are buried in Longmeadow Cemetery. He has a FindAGrave memorial, but there doesn't appear to be a stone. The other is a 7th great-grandfather by the name of Nathaniel Owen, born on November 21, 1683, in Braintree, Massachusetts. Also in the Ancestry.com Massachusetts Town and Vital Records compiled by Jay and Delene Holbrook is a printed collection of Braintree Records. Nathaniel Owen married Deborah Parmenter on April 22, 1714, and fathered nine children. He died on November 12, 1728, in Braintree. How wonderful that Massachusetts vital records have been kept for so many centuries! Oh, now I wish I had Massachusetts ancestors, too! Many of my older ancestors just have 'about' dates. In fact, the man I'm using for 'closest to my birthday' I chose because he was a direct ancestor born in February... my month... though I don't know what day. Yes, I'm spoiled when it comes to my Massachusetts ancestors and when I research in other states, I get frustrated that there are not records like Massachusetts has! 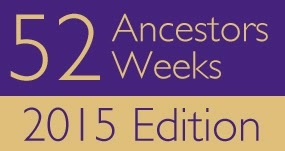 I was surprised to find these two direct ancestors with my specific birth date! Thanks for reading and I look forward to reading your post for closest to your birthday.